The proliferation of sushi restaurants in San Franciso reflect the large Japanese-American community there. Sushi has come a long way in shape and style over the past few years, and many people who claimed they would never in a million years eat raw fish now happily munch on rolls stuffed with items like chicken teriyaki and deep-fried asparagus. San Francisco is a wonderful city to visit if you're an adventurous sushi eater-it's easily one of the most popular types of cuisine in town. Check out our selective guide below to the best sushi restaurants in San Francisco. Affectionately known as "No Name" due to its lack of an illuminated sign out front, Yokoso Nippon Sushi is one of the cheapest and most popular places to grab a bite of sushi in the Castro/Mission area. The maki rolls are enormous, and nearly everyone who comes in orders at least one serving of California rolls. Service can be a bit brusque, and the lines to get in on weekend nights are agonizing. This is also one of the tiniest restaurants in the city, so if you have claustrophobia problems…I am a die-hard sushi lover, and this is the first place I recommend to anyone looking for a good fix. Without a doubt one of the most unique sushi joints in the city, Country Station's servers-most of whose fashion sense comes straight from the Jim Henson movie "The Dark Crystal"-serve up delectable maki and nigiri rolls to the sounds of bands like Black Sabbath and Ween coming from the speakers. The restaurant is situated on one of the grimiest and scariest corners of the Mission (right at Sycamore Street Alley), and you can expect a lot of shady characters hanging about outside as you make your way to the front door. But once you get inside expect exceedingly friendly service, funky, slapdash décor, and mouthwatering bites. 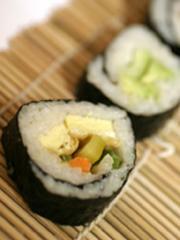 This relatively new sushi restaurant won CitySearch's highly coveted Best Sushi Restaurant of 2005 award. Exotic rolls like Hot Love (baby lobster with avocado and crab meat) and an incredible selection of sake keep the customers coming in. Many sushi options for vegetarians, plus sashimi dishes and lettuce wraps (i.e. Japanese burritos) too. Reservations are strongly recommended. Longstanding Inner Sunset sushi favorite seems to win every annual Bay Area award for best sushi-the SF Weekly, Chronicle, and Guardian have all given it the number one spot in sushi restaurant surveys. Always packed, sushi lovers come out in droves for the restaurant's many creative special rolls, including the QP roll (chopped scallop) and Hanukkah roll (smoked salmon). The restaurant can cater any occasion, and there is now an Ebisu stand open in terminal G of the San Francisco International Airport. For those in need of an immediate sushi fix, Warakubune is your place. This is a sushi boat restaurant-there is a water-filled moat surrounding the sushi preparation kitchen, and right outside the moat is a wrap-around tabletop for customers to sit at. Sushi chefs make fresh sushi rolls continuously, and place what they make in the moat on little boats, and customers pick and choose whatever they want off the boats. Go for the BBQ eel, yellowtail, and salmon rolls. Rolls are priced according to the dish the sushi chef places them on, so try to keep a running tab in your head on how much you're consuming (you can really blow a lot of money here if you aren't careful!). Extraordinarily chic sushi restaurant offers elegantly prepared and elaborate spins on favorites like the California roll. All who go to Tsunami come back talking about how incredibly fresh all the rolls taste. They also talk about how sometimes the music coming from the sound system can get a wee bit too loud. This is pricey sushi, ideal for a special occasion or date. There's also an incredible selection of sake to go with your dinner-the wait staff are adept at informing customers which sake goes best with what they're eating.